Game One was all about the Giants, with their big hits and masterful pitching by Madison Bumgarner, and the Royals fans in Kauffman Stadium were getting a reminder as Game Two got underway. Yordano Ventura, the Royals starter and the future of the KC pitching staff, started Game Two by giving up a lead off homerun to Gregor Blanco. You could feel their air get sucked out of Kauffman Stadium as the Royals fans watched Blanco’s blast sail over the right field wall. They remembered what happened in Game One, when this same lead off man started a three-run inning for the visiting San Francisco Giants. The San Francisco Giants during Wednesday’s batting practice. The solo homerun would be the only reminder of Game One and it quickly faded as Yordano “Ace” Ventura settled in and retired the next three batters. The rookie pitcher kept the Giants from scoring for the next two and two-thirds innings until Brandon Belt doubled in the 4th and brought Pablo Sandoval across home plate. Those would be the only two runs the Giants would score all night. The Royals bats didn’t stay silent and were able to tie the game in the bottom of the 1st and then pull ahead by a run in the 2nd. The Giants were able to tie the game in the 4th and that is where the score stayed, 2-2, until the bottom of the 6th inning. The 12-year veteran starter Jake Peavy was on the mound for the Giants. He had only given up two runs so far in the game and it was tied. But in this bottom half of the 6th inning the Royals batters went to town. They sent eight batters to the plate, starting with a single by Lorenzo Cain. Eric Hosmer walked, pushing Cain into scoring position on 2nd. That was about enough for Peavy, manager Bruce Bochy decided. Before the game it was a common observation that Bochy would need to figure out a way to get some of his mid-relievers into the game because a few hadn’t pitched in a long time. The Royals had figured out a way for the Giants manager, who sent Venezuelan right-hander Jean Machi to relieve Peavy. Three more pitchers later Kansas City had scored five runs. Omar Infante, a Venezuelan second baseman had only six homeruns all season, but he capped off the bottom of the 6th with a two-run homer that scored catcher Salvador Perez, who himself had just doubled off of Hunter Strickland — the fourth Giants pitcher of the inning — sending Hosmer and Terrence Gore across the plate. As Perez and Infante were rounding the bases Strickland was yelling at himself, at fate, maybe at the two Royals running the bases. Perez thought the Giants pitcher was yelling at him so once he stepped on home plate he decided to confront Strickland … and then the home plate umpire stepped in and Giants catcher Buster Posey walked to the mound to calm down his pitcher. That was about it for Strickland, who had faced only two batters, but in that time threw a wild pitch that put two runners in scoring position and then sent four runs across the plate for the Royals. That is when Bochy made the call for Jeremy Affeldt, a mid-reliever with a 2.28 ERA, to get the Giants out of that mess. 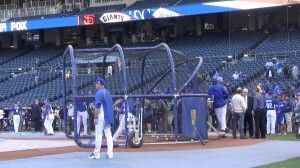 The Kansas City Royals during Wednesday’s batting practice. The Giants used five pitchers in the bottom of the 6th, hoping to keep the Royals from scoring, but KC had an answer for the first four. For their part, the Royals bullpen shut down the Giants bats for the rest of the night and the Royals more than made up for their Game One loss. The game ended without the Royals coming to the plate in the 9th, the score 7-2. Looking at the first two games, it has been about the starting pitchers. In Game One Bumgarner shut down the Royals. In game two Yordano Vetnura gave up only two runs in 5 and two-thirds innings. Jake Peavey gave up 3 runs in six and a third innings. But it was the Kansas City bullpen that made the difference in Game Two, shutting down the San Francisco hitters after Ventura was relieved in the 4th inning. Just as important though was the hitting. In game One the San Francisco bats sent James Shields to the bench early, when manager Ned Yoist was hoping his starter could go deep into the game. San Francisco score seven runs on 11 hits in that opening game. In Game Two the Kansas City batters found their groove, scoring seven runs on ten hits. Neither team is a clear favorite in this World Series and we can expect this series to go six games at least, but more likely seven. If the series comes back to Kansas City, and I believe it will, the Royals are most likely going to be the 2014 World Series Champions. All they need to do is win one in San Francisco. But that isn’t a strong advantage. The Giants won big in Pittsburgh, Washington, D.C. and St. Louis when they absolutely had to win and in this series they have already won in Kauffman Stadium, so it’s too early to start predicting a winner of this series. Two wild card teams that weren’t expected to make the League Championship round, are now tied 1-1 in the World Series. Starting pitchers for Friday’s Game Three will be 10-year veteran Jeremy Guthrie for the Kansas City Royals and 15-year veteran Tim Hudson for the San Francisco Giants. Hudson had a tough September, but in the post-season he has an ERA of 3.29. Guthrie, on the other hand, has a post-season ERA of 1.80. First pitch will be at 8:07p.m. Eastern Time in AT&T Park in the City By The Bay, San Francisco, CA. All photos by Claudia Gestro. ← Was Edgar Allan Poe robbed?